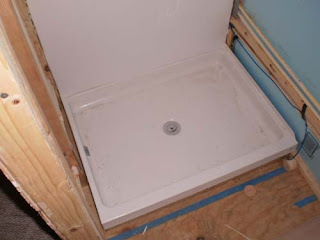 The last couple days I have finally had time to work on the bathroom and kitchen sink in the bus. 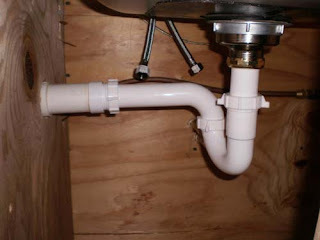 Here is the sink with the P-Trap installed. Here it is on the other side of the (bathroom) wall. 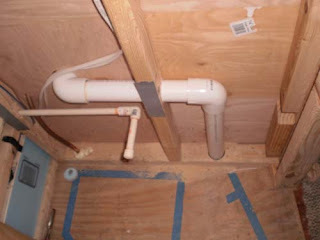 I used 1 1/2" pipe for the drain. I cut through the floor with a hole saw and it worked well even going through the metal floor and a support beam that just happened to be in the way. Now I was ready for may paneling. A couple of days ago we picked up some supplies from Lowe's. I cut out the plywood to stand vertically so that I would not have any seems only corners. After verifying that the plywood fit well I took it back out and used it as a pattern for the plastic sheet. 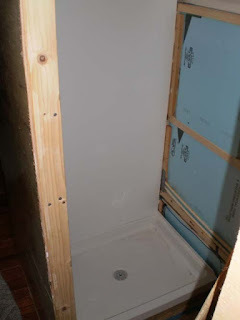 The plastic sheets will be the water proof walls on the inside of the bathroom. Then I took the plywood back in and installed it. 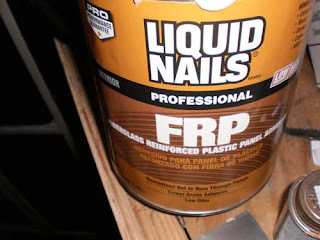 Then I applied the FRP Glue and set the panel in place. I used a rubber roller to roll out any excess glue. It worked well.